Many people like to color text in different colors when studying. In that way, certain parts of the learning subject are categorized by color and memorized easier. When you color text on the paper books you use a felt tip. There is a way to color text on digital documents and ebooks as well. Microsoft Word and Google Docs, the most popular word processing tools, have that option. Here we will show you how to highlight in Google Docs. Google Docs is often used among teachers and students. It is convenient because it is cloud-based plus it is free. You can access documents on every computer or a mobile device as long as you are signed in to your gmail account. Similar to Microsoft Word, you can make document changes such as numbering pages, changing margins, creating quizzes, highlighting and so on. 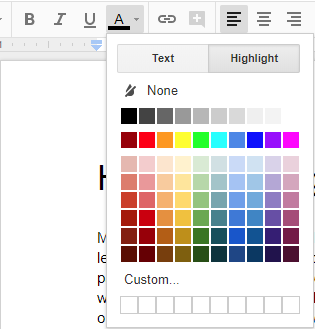 Here is a detailed guide on how to highlight in Google Docs and colour text in different colours. Click on it and you will see two tabs: Text and Highlight. Select a part of the document (text) you want to colour. The easiest way to select text is with a left-single mouse click. Hold it and move in the direction where you want to highlight the text. If you are not sure how to do, check out this video. Now, click on the Text colour button and then on Highlight. Choose the colour you want. If you want to remove the highlight, click on None. To choose different shades and colours, click on Custom, find the colour you want and click OK. The steps we explained above are a little bit different for mobile devices. So, to highlight in Google Docs on Android device, select the area of the text, and click on the letter A (next to the + sign). As for the selecting text, you need to use the tap of your fingers instead of a mouse click. A menu will show up at the bottom. Tap on the Text and scroll down to find Highlight colour option. Choose the colour you want and tap on it. Selecting text is easy, it is just a matter of practice. Maybe it is easier to select text with a mouse click on a computer than on a mobile, with a tap of your fingers. But when you learn both, you won’t have problems studying and highlighting text on the go. It will be the same practice as highlighting with a felt tip.